On sale! (normally $499) Transform music into light with the Nanoleaf Rhythm. Plug it in, turn it on, and embark on a sensory adventure personalised just for you. Introducing the Nanoleaf Rhythm, a smart lighting product designed to help you light up your life your way. Watch your Nanoleaf light panels dance to music with the sleek Rhythm module! No wires, simply plug the module into any of the Nanoleaf light panels and see it react to music in real-time. In addition to customising within the app, you can also toggle through saved Rhythm Scenes via its built-in button. The modular dimmable light panels can bathe you in as many colours as there are people in New York City. They can also recreate the perfect white light for your needs - sunrise, rainy day, brilliant daylight, or anything in between. Create unique shapes and designs with the modular panels, and select your own colour palettes to set the mood and create ambiance inside. Experience your favourite songs like never before by transforming them into mesmerising displays of colour. Or create your own Rhythm Scenes and show off your creativity to the world with the ‘Discover’ tab in the Nanoleaf App. Share your own created Rhythm Scenes, vote for favourites and curate personal playlists. With three control options, using the app, your voice or the physical button, the Rhythm offers flexible convenient control. Easily create your ‘date night’ playlist with the App or switch Scenes with your voice. Toggle between saved scenes on the Light Panels with the physical controller even when your phone isn’t around. 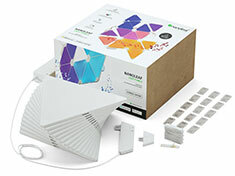 Each Smarter Kit is expandable up to 30 panels (see Nanoleaf Light Panels Expansion Kit).